Protests on behalf of low-wage workers took place Wednesday from coast to coast, with demonstrators in New York, Los Angeles, Chicago and other cities demanding pay of $15 an hour. In Brooklyn, about 300 workers kicked off the national day of demonstration at 6 a.m. on Flatbush Avenue to call for better salaries and benefits. "What do we want? $15! When do we want it? Now!" the workers chanted. 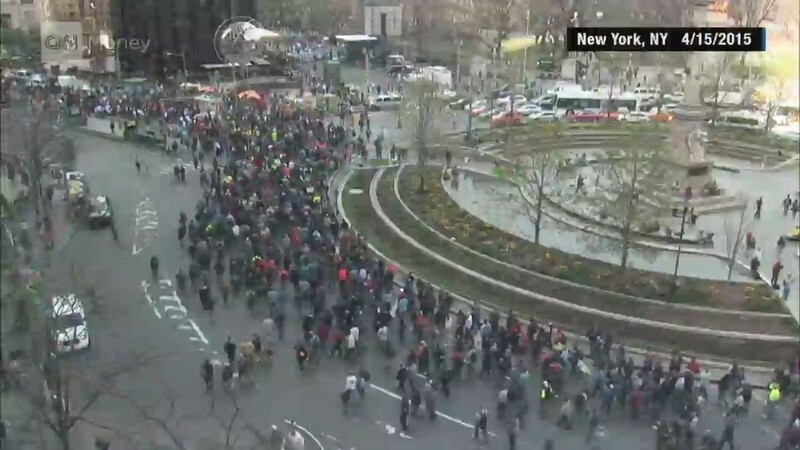 Later in the day about 1,000 protesters marched to Columbus Circle in Manhattan, occupying four blocks of Central Park West. "We demand the right to earn a living wage. We have a right to take care of our families just like the Trumps," said local union president George Gresham at the rally just outside the Trump Hotel. Workers also demonstrated at McDonald's restaurants in Jackson, Mississippi, Boston, Denver, Albany, New York, Detroit and elsewhere, according to reports and pictures on Twitter. More protests were planned for later Wednesday in what organizers said would be the largest such demonstration of its kind. The push by low-wage workers has gained some traction, with several cities and some states raising the minimum wage earlier this year. It also has the potential to become politically charged as the 2016 Presidential campaign heats up. Hillary Clinton, who recently announced plans to run for the Democratic nomination, voiced support for the protesters. "Every American deserves a fair shot at success," Clinton said on Twitter. "Fast food & child care workers shouldn't have to march in streets for living wages." New York City Mayor Bill de Blasio tweeted: "Our City will continue to #FightFor15 because the minimum wage must keep up with the cost of living." 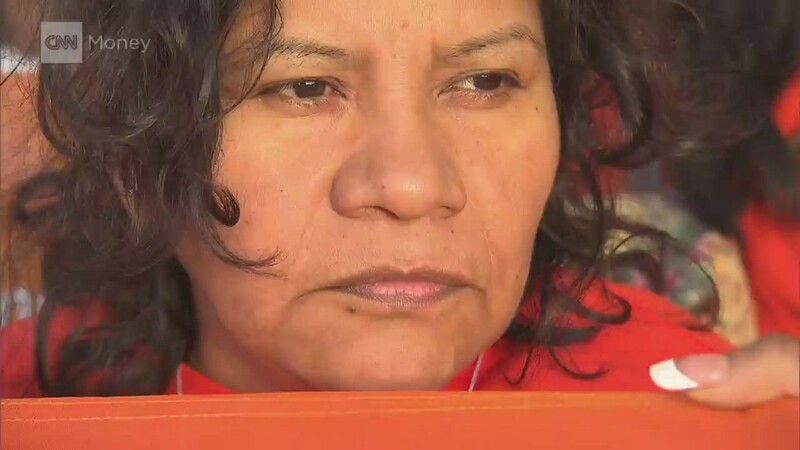 In New York, April Rodriguez, a construction worker and single mother with three children, said she works from 7 am to 9 pm and still struggles to pay her bills. "I hope the workers get what they need to survive because the cost of everything keeps going up but the wages stay down," Rodriguez said. 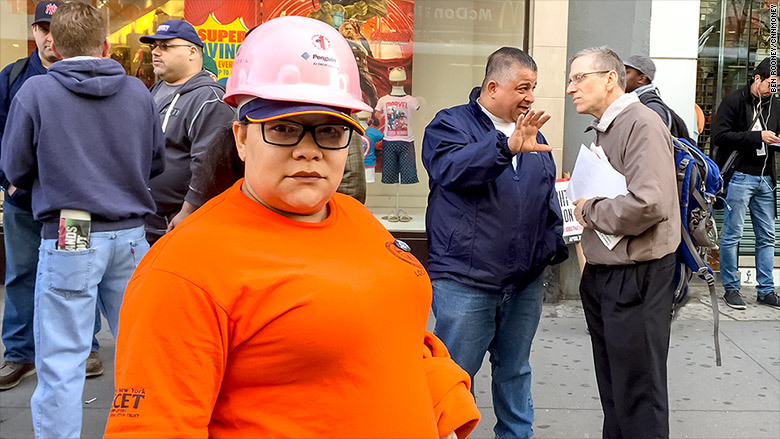 April Rodriguez, a Brooklyn native, wants fair wages for construction workers. The movement for $15 an hour started more than two years ago with fast-food workers in New York and a handful of other cities. Now, a broad coalition of employees from the retail industry to home care aides and adjunct university professors have joined the protests. Related: Will Hillary Clinton support a $15 minimum wage? Jacqueline Taylor was an adjunct professor at New York institute of Technology, where she taught courses in art, before she was laid off. "I feel that corporations and institutions are taking in huge profits at the expense of low wage workers," she said. "It's a disgrace." The demonstrations are being organized by a group called Fight for $15, which is backed by community- and faith-based groups, as well as labor unions such as Service Employees International Union. "Working people are going to keep speaking out in the streets, in their communities, and at the ballot box until we raise wages, strengthen the economy, and build a democracy that works for all families," said SEIU president Mary Kay Henry. Organizers say students at more than 100 universities nationwide plan to participate in Wednesday's demonstrations. They also expect fast food workers and others to protest in Italy, Brazil and Japan, among other international locations. 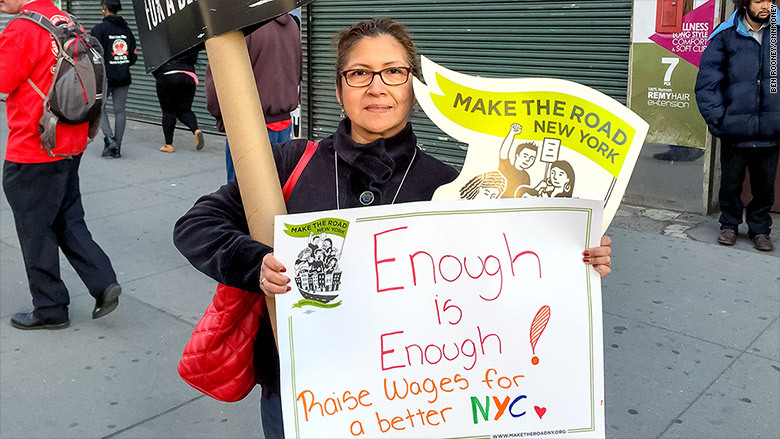 Silvia Meza, a child care worker in New York, is calling for higher wages. All told, organizers expect 15,000 workers, students and activists to take part in the various protests in New York City. The protests are taking place just weeks after McDonald's announced a pay hike for workers, but that increase is only taking effect at the McDonald's-owned restaurants and not the franchises that employ 90% of the company's workers. McDonald's said in a statement that it respects "people's right to peacefully protest." The company reiterated that it recently raised wages for workers at company-owned restaurants and continues to "look at opportunities that will make a difference for employees."